In 2008, Barbie® released a special edition Alpha Kappa Alpha doll for the AKA centennial celebration. Ever since, there has been a small online movement to make Barbies for all of the other D9 sororities and it is growing steadily. 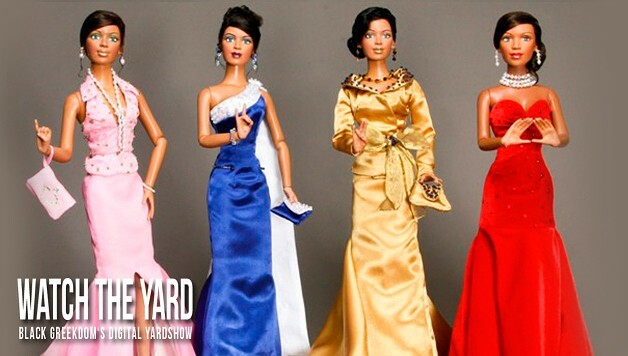 We at WatchTheYard.com love to see that there are dolls out there for little girls to play with that encourage them to go to college and which look like the very women they aspire to be. We would, however, love to see some dolls made which reflect a wider range of Black female body types, but we do understand that this is a step in the right direction. Would you buy one of these for your child/niece/god daughter? Let us know in the comment section below! Click on the image/arrows below to move between the slides to see our collection of AKA, Delta, Zeta and SGRho dolls. This is the AKA Centennial Doll which was officially released by Barbie® in 2008.